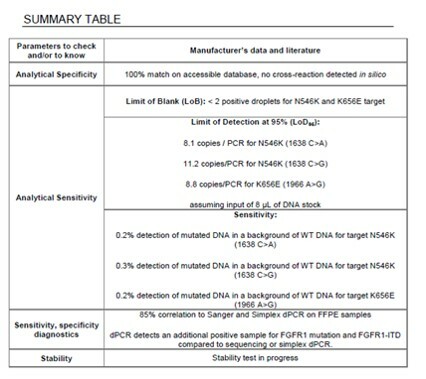 The IDFGFR1-SNC kit is an in vitro diagnostic test designed to detect and quantify, by digital PCR, three variants (N546K c.1638 C>A and c.1638 C>G and K656E c.1966 A>G) and FGFR1 (fibroblast growth factor receptor 1)internal tandem duplication of the tyrosine kinase domain (exon 11 -18) in one reaction for each sample. Mutations in the tyrosine-kinase receptor Fibroblast growth factor receptor 1 (FGFR1), lead to constitutive activation of the MAP-kinase pathway in pilocytic astrocytomas. In contrast to the FGFR1 amplification, frequently observed in breast, ovary, and lung cancer, gene fusions and duplications are described at low frequencies in brain tumors such as glioblastomas and pediatric diffuse astrocytomas, respectively. In pilocytic astrocytomas, the main described alterations of FGFR1 are point mutations in the hotspot tyrosine kinase region, affecting mainly the codons 546 (p.N546K) and 656 (p.K656E) of the gene in extracerebellar pilocytic astrocytomas. FGFR1 internal tandem duplication (ITD) of the tyrosine-kinase domain (FGFR1-ITD), another genetic alteration that also leads to MAP kinase pathway alteration, has been reported in low grade neuroepithelial tumors. 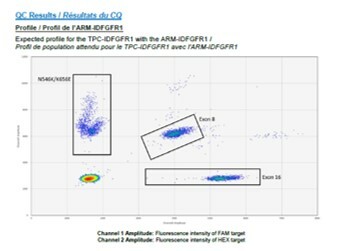 FGFR1 alteration mainly represented by FGFR1-ITD is a frequent event in dysembryoplastic neuroepithelial tumors. 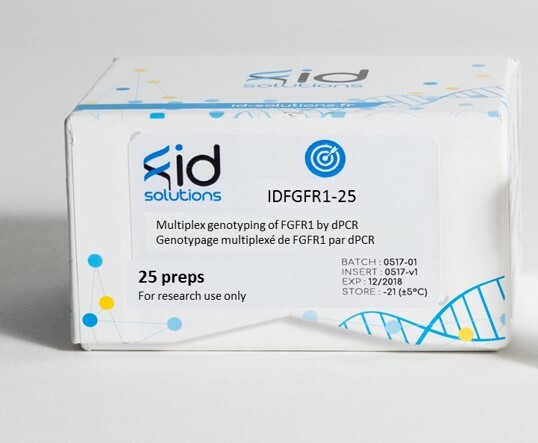 The IDFGFR1 kit has been validated for the detection of N564K, K656E mutations and the internal tamdem duplication of FGFR1 present on FFPE extracted DNA in comparison with NGS.